Christened as Camarines Sur’s mountain paradise, Mt. Isarog National Park (MINP) that is wrapped with radiant forest from base to peak, the 1,966-meter high Mt. Isarog has been placed under the process leading to its proposed designation as a biosphere reserve. A biosphere reserve is a voluntary and cooperative conservation area created to protect its biological and cultural diversity while promoting sustainable economic advancement. Once the process of designation is perfected and the United Nations Educational, Scientific and Cultural Organization (UNESCO) is convinced, the 10,112-hectare national park will have more prospects toward broadened protection and ecological development. It would also earn international recognition as a place of cooperation, education and experimentation where scientists and managers can share research data to better understand man's impact on nature and where local communities, environmental groups and economic interests can work collaboratively on conservation and development issues. Biosphere reserves are established under the auspices of the UNESCO’s Man and the Biosphere (MAB), a program established 40 years ago to achieve a sustainable balance between the sometimes-conflicting goals of conserving biological diversity, promoting economic development and maintaining cultural values. Once established, the area becomes a site where this objective is tested, refined, demonstrated and implemented. In order to be designated a biosphere reserve, a candidate ecosystem must be nominated by the national government or any of its institutions and approved by the MAB based on the program’s requirements that include three elements—core areas, buffer zones and transition or cooperation zones. Core areas are securely protected sites for conserving biological diversity, monitoring minimally disturbed ecosystems, and undertaking non-destructive research and other low-impact uses such as education. Buffer zones are clearly identified areas that usually surround or adjoin the core areas. It may be used for cooperative activities compatible with sound ecological practices, including environmental education, recreation, ecotourism and applied and basic research. Transition or cooperation zones are locations that may contain farms, fisheries and other human activities and where local communities, management agencies, scientists, non-governmental organizations, cultural groups, economic interests and other stakeholders work together to manage and sustainably develop its resources. As take off point for the process, the Central Bicol State University of Agriculture (CBSUA) based here has been chosen to undertake the nomination procedure starting with a two-day consultation-workshop on the MAB program for MINP held in Naga City last week. The area that harbors rainforest, endemic wildlife, watershed and is home to nomadic Agta tribesmen was declared a national park in 1938 and since then, it has been subjected to full government protection and preservation. The Park that boasts of a rich diversity of flora and fauna is home to at least 143 kinds of birds, 15 of which are endemic to Luzon, including a sub-species of the Velvet-fronted Nuthatch which is found only in Mt. 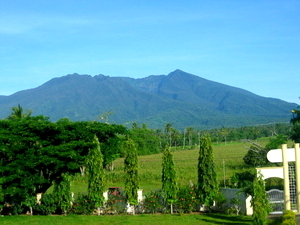 Isarog, an inactive stratovolcano known as the highest forested peak in Southern Luzon. The volcano, towering at 1,966 meter-above sea level, sits in the heart of Camarines Sur, the central part of the Bicol Peninsula. Other species endemic to the mountain are the Mt. Isarog Shrew Mouse, Isarog Striped Shrew Rat, the Isarog Shrew Rat and the Isolated Forest Frog. The park is also home to the Philippine deer, monkeys, bats, wildcats and wild pigs and teems with 1,300 known species of plants including hardwood trees, mosses, ferns and orchids. As an ecotourism destination, the MINP had several exotic waterfalls, among them the Malabsay that is suited for picnics and swimming and Magragobrob, a 40-meter fall from where sulfuric water emanates and drains into the Rangas River. Others are the Tumaguiti and Bulalacao that are composed of several smaller falls from where the Hiwacloy Sulfur Springs in Goa town draws its sulfuric water that attracts a throng of bathers daily for its known cure to skin diseases and other minor ailments. A tunnel system constructed within the area during World War II is an additional tourist attraction which is believed to hold treasures buried by Japanese soldiers before their surrender to the liberation forces. A deer farm that provides a safe home to five different species of deer and a butterfly garden swarming with over a hundred types of colorful butterflies have been both established by the provincial government of Camarines Sur in separate vast areas in Tigaon town and this capital town, respectively, as among the measures to protect the park’s biodiversity. When finally proclaimed as a biosphere reserve, MINP would be given the opportunity to collaborate development and conservation efforts with Palawan and Puerto Galera, the only two areas in the country earlier placed by UNESCO under the program. The Palawan and Puerto Galera biosphere reserves have already been fulfilling their three basic functions under the program for years now in the conservation of landscapes, ecosystems, species and genetic variation; development that fosters economic and human development which is socio-culturally and ecologically sustainable; and in logistic that provides support for research, monitoring, education and information exchange related to local, national and global issues of conservation and development, according to Batanes.